Maybe the sensor is not broken? You are not the only one to notice the “wacky” San Luis readings. No we have not moved the sensor and there are no new structures near the sensor. But something has changed and that is the Bay Area wind patterns. More and more frequently we are getting spring and summer northerly winds coming down the Central Valley. This change is related to increased # of NPH ridges we keep mentioning in the forecasts as well as the Golden Gate Eddy. So what does this have to do with wacky San Luis winds? Take a look at the animation below and watch the battle between northerly and more southerly wind over San Luis. 1. In the morning the marine layer is often deep in Pacheco Pass and WSW wind blows at the sensor. 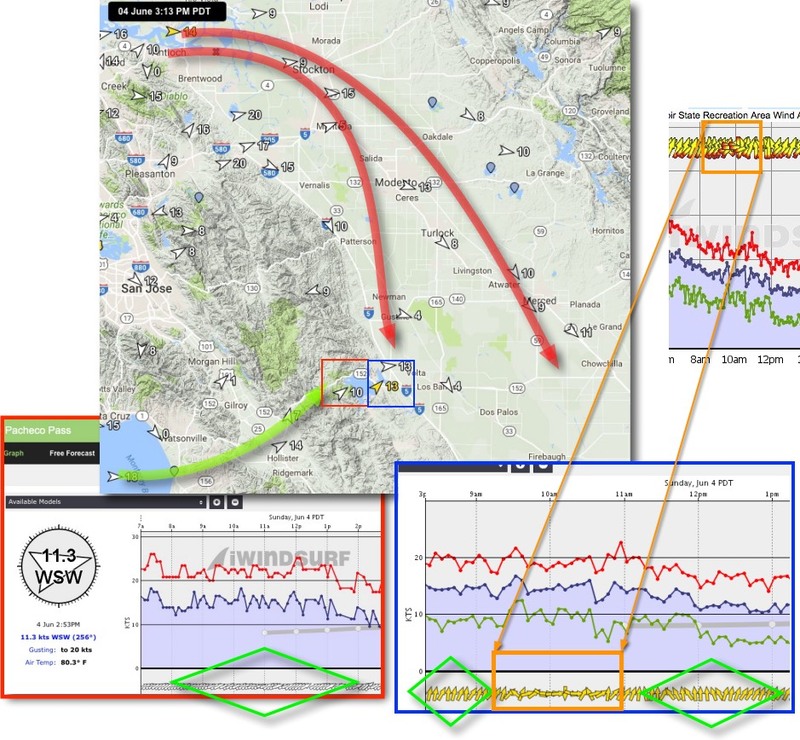 See GREEN arrows and GREEN diamond on wind graph below for Pacheco Pass. 2. If there is northerly wind in the Central Valley (see RED arrows) it hits the hills just north of the sensor creating northerly turbulence. This northerly turbulence spreads randomly over the Forebay area. So at some locations all you sense is the wind from the pass while other areas get mostly northerly wind while others get a mixture. The higher your location and the more easterly your site the more northerly wind you will feel. 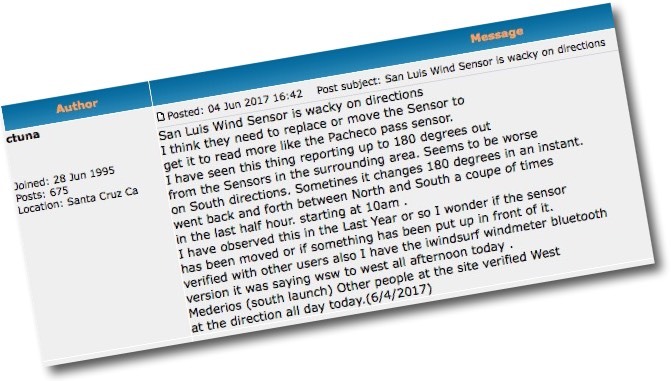 If you look at the San Luis archives for the month of May you will see the pattern of SW wind then N wind then SW wind punctuated with “wacky” readings very frequently. And on each of those days there was northerly wind in the Central Valley. The reason you see different directions at different nearby sensors is the different frequency they update. Our sensor updates more frequently than most of the other sensors so it shows more of the “wacky” changes. Of course my hypothesis could be nonsense and actually it is a wacky osprey that lands on the wind vane each day to avoid the northerly winds and then takes off when the marine winds start. Hopefully no one will ask why we are seeing more ridges, eddies and northerly wind!